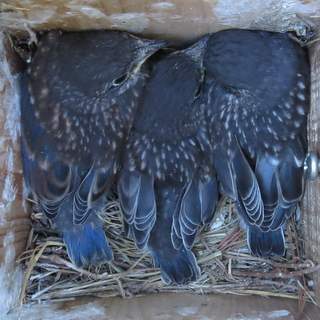 Eastern bluebirds are Cavity Nesting Birds. 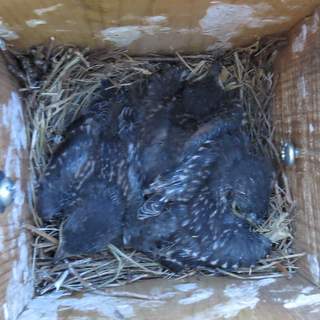 They will nest in tree cavities or in nest boxes (aka bird houses). Bluebirds are very well adapted to backyards with short vegetation and scattered trees. They hunt insects from a perch, flying to the ground to capture their prey. If you want to attract bluebirds to nest in your yard, put up a Nest Box designed for bluebirds. Besides putting up a nest box, you will need to control House Sparrows as they will prevent bluebirds from nesting. Bluebirds do not eat seeds so you won't see them at your seed feeders. They will eat mealworms. They especially like live mealworms but they can be expensive. I've had them eat dried mealworms on occasion but other birds usually find them and eat them all before the bluebirds find them. Some people have luck with them eating suet but I've not had them eat it. Providing a water source is probably a better way to attract them than providing artificial food. Putting up a nest box for bluebirds may entice them to nest. But putting up a nest box will more than likely also attract both house sparrows, introduced invasive species. Before you decide to put up a nest box for bluebirds, you must commit to preventing house sparrows from nesting in your nest box. They will destroy the eggs, nestlings and adult bluebirds, given the chance. If you are ready to control house sparrows, then you will need some nest boxes. Various literature recommends a 4 to 5 inch square box. Based on my experience, I find a 3 1/2" X 4" box works well. It uses pine boards, which are smooth on all surfaces. The box uses a front opening design and allows for nest box traps to be inserted. A Nest Box Trap should be used to trap competing house sparrows. I'd suggest erecting more than one nest box as the extra nest boxes can be used to trap the invasive house sparrows and may attract other native nesting birds such as tree swallows. Bluebirds prefer a nest box that is mounting at 5' to 10' high in an open area with few to no trees. A 10' high mounting is prefered by the birds as it is safer from predators. A nest box mounted at 5' will work well in landscapes where the surrounding vegetation is kept short. But where vegetation is taller, a 10' mounting is your best bet. 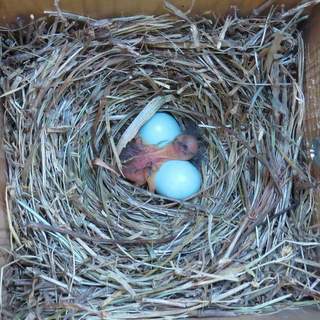 The method of mounting your bluebird nest box is as important as the design of the nest box. Mounting to a tree or wood post is not a good idea, as predators will be given easy access to the box. Furthermore a nest box mounted on a tree is difficult and dangerous to monitor. A much better technique is to mount the box on a telescoping pole. This allows the box to be be easily monitored. Bluebirds are birds of open country. Do not mount nest boxes in wooded areas. The House Sparrow is an invasive non-native bird species that compete negatively with our cavity nesting native birds for nest sites. Like the bluebird, they are a cavity nesting bird. 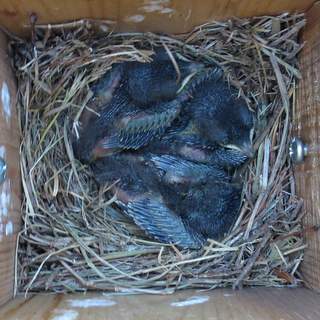 They will destroy the nests and nestlings of bluebirds as well as other native cavity nesting birds. Even if they don't destroy the nest, they will drive the nesting bluebirds away from their nest. You must commit to trapping house sparrows to prevent them from competing with bluebirds and other native cavity nesting birds. After years of house sparrows preventing my bluebirds from nesting, I finally purchased a Nest Box Trap to catch the house sparrow male. House Sparrows are not native to North America and compete aggressively with our native birds. Once I trapped the house sparrow, the bluebirds started nest building that same day.This video shows the male feeding the babies. This is the second nesting for bluebirds in my yard in 2013. 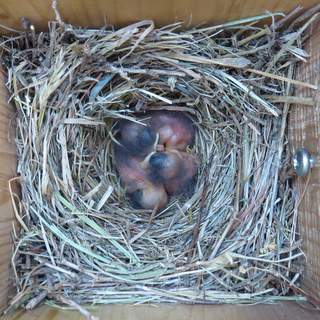 Their first nesting was about 60 feet away in another nest box. Again, I have been trapping House Sparrows, a non-native unprotected species. Watch as the female makes multiple trips to the nest box. She is gathering grass clippings that I have scattered in my vegetable garden. The male follows her as she gets the material, and follows her to watch over her as she enters the nest box. I especially enjoy listening to the singing house wren in the background of this video. 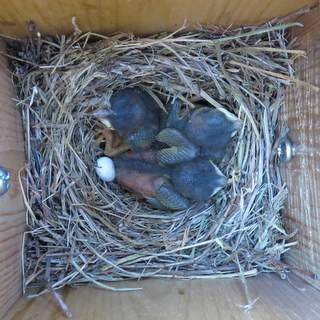 It is truly amazing to see the progression of a nest from eggs to fledging bluebirds. This was a second brood.